You wash dishes and the lighting is so bad you can’t tell if the plate is clean. The lettuce looked good when you were rinsing it, but now the leaves are looking a little iffy. The overhead light may illuminate the kitchen overall, but you have to work in your own shadow at the sink. Your cabinets, ceiling height and budget factor into your choice of over-the-sink lighting for your kitchen. You have many options to choose from. Good lighting is essential over a kitchen sink. 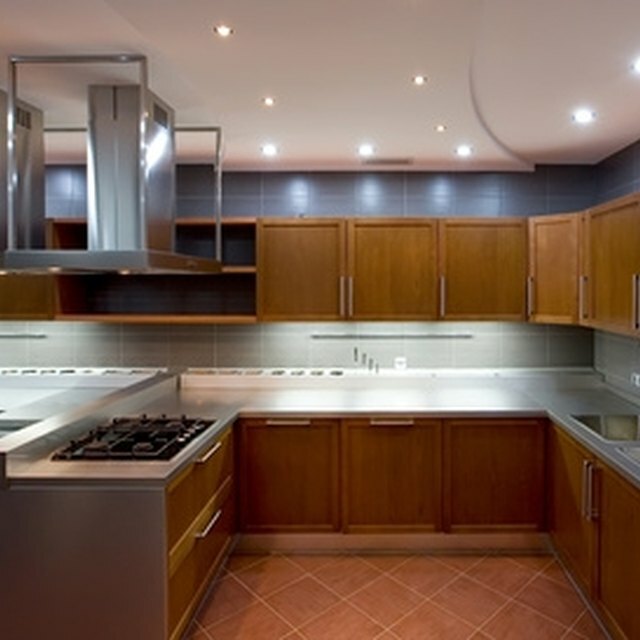 If you have cabinets above your sink, think about placing lighting underneath them with tube lighting or pot lights. These options allow for direct light on your work area without clunky fixtures and globes. Under-cabinet fixtures give you the lighting you need while keeping your kitchen streamlined and contemporary. High ceilings give you the vertical space to hang a chandelier above your sink. This adds glamour to the decor. Whether you want a flashy chandelier with crystals and intricate metalwork or something simple, choose a chandelier that is functional and beautiful. Some chandeliers have lighting that points upward or is mostly covered by shades or colored globes, giving off minimal light. Chandeliers above the sink must provide adequate lighting downward. This option adds pop between two cabinets against a wall or above a sink installed in a work island in kitchens with traditional themes. Working under the same principle as chandeliers, pendant lights, either singularly or in a series, hang down from the ceiling and aim light downward on your work area while adding extra style to your kitchen. Pendant lights are generally smaller and less flashy than chandeliers but can add tiny dollops of color and texture to your room. Hang the lights where you are not going to bump your head while washing the dishes. Track lights put brightness exactly where you want and need it. Though highly functional, some are not aesthetically pleasing. Pick track lights that incorporate elements in your kitchen, mimicking the cabinet hardware and sink fixtures. Track lights work well with contemporary kitchens, such as those in studio apartments with exposed beams and brick or concrete columns. If you need the light but don’t want anything hanging from the ceiling, recessed lighting might be a good option for you. Recessed lighting is installed directly in your ceiling so you decide exactly where you need the light. If you already have a main light fixture in your kitchen, recessed fixtures give you lighting without taking away attention from the main piece. This option is effective in homes with lower ceilings where a hanging fixture would get in the way or emphasize the lack of vertical space. Sconces attach to the wall and often have multiple lights on one fixture. Look for sconces with lights that point down to your sink and globes or shades that do not take away from the functionality of your light source. What Is the Difference Between a Flush vs. a Semi-Flush Light Fixture?